This essay appeared in the book published to accompany Communicate! British Independent Graphic Design since the 1960s, an exhibition curated by Rick Poynor at the Barbican Art Gallery in London in 2005. The history of journalism about graphic design in Britain is, in large part, the history of specialist design journals. Unlike other spheres of contemporary art and design, graphic design rarely draws a mention in the culture or business pages of newspapers or on television arts programmes. Whilst the media regularly discusses new products as objects of desire and public architecture attracts both controversy and acclaim, only the publicity-seeking fringes of graphic design draw attention. In recent years shock advertising and earlier, in the late 1980s, the rebranding of privatised industries (‘BT Blows Millions on Trumpet’, The Sun) have been put under the spotlight. Like language itself, graphic design seems so deeply ingrained in the texture of daily life that it is taken for granted. Whilst this might be seen as graphic design’s achievement, it has been a cause of concern for those who wish to promote the pecuniary and professional interests of designers, as well as for those who want to put the social and moral effects of their work under close scrutiny. Magazines are commodities and, with some notable exceptions, most are produced for profit. Since the 1950s the news-stands of Britain have had to grow to accommodate the new titles that have burgeoned year on year. Seizing the economic benefits produced by new printing technologies (not least the desktop publishing revolution of the 1980s), magazine publishing is increasingly characterised by specialist titles serving particular and often narrow interests. The fact that British readers today can purchase half a dozen home-grown graphic design titles when none existed a generation ago might seem to be a simple reflection of the same unerring commercial ‘logic’ that has produced a dozen different gossip magazines over the same period. As Blueprint (1983-) stressed in an early editorial: ‘once upon a time people started magazines because they believed that people would want to read what they had to say; today it is more likely that a magazine is launched because the advertisement sales manager can see a “gap in the market”’. Blueprint was itself, however, initiated by volunteers prepared to write pro bono, ‘moonlighting’ from careers elsewhere. The motives behind the launch of this and, in fact, many other design titles cannot be reduced to commercial opportunism (even if some of these magazines have espoused an out-and-out commercial philosophy). As this short essay reviewing the recent history of graphic design journalism in Britain sets out to show, in launching new graphic design magazines like Creative Review (1980-) or Dot.Dot.Dot (2000-), editors and publishers sought to change the world in which their readers lived and, more specifically, in which they worked. In great part, the readers of these titles have tended to be designers and others working in closely-aligned fields. Whilst few titles have been explicitly ideological or doctrinaire in the manner of the avant-garde in the 1920s, most have sought to create an imagined ‘community’ of readers; to raise the status of the professions they report; and to influence the quality of design. This is ideological work that extends beyond ‘mere’ commercialism (and sometimes pitches publisher against editor, and advertising against editorial). It has never been a surprise to designers that representation is ideological, even if this is a term which they might not use: to portray and frame one’s activities and those of others is to assert power and is, ultimately, an attempt to shape the world. 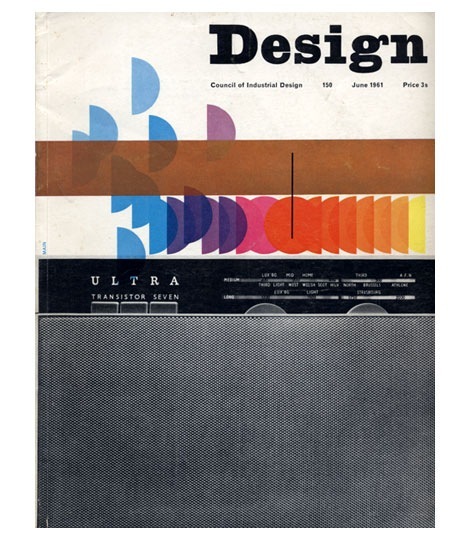 If Typographica was idiosyncratic and eclectic, Design magazine (1949-1999) the official mouthpiece of the Council of Industrial Design (CoID/re-designated as The Design Council in 1972) was much more self-consciously ideological. A monthly reporting the design of consumer and capital goods as well as some aspects of graphic design like packaging, Design proselytised for a ‘good design’, a concept never adequately defined and closely connected to a taste for modernism. An official and bureaucratic organisation funded by grant-in-aid from government, the CoID saw itself as both a servant and a critic of industry. If the design standards of manufacturers and the level of taste of consumers could be raised, Britain’s dire postwar economic situation and the quality of ordinary lives would be improved. Design expounded a technocratic view of progress: designers were technical experts who, working alongside engineers and other specialists, were best able to make rational judgements about the appropriate form of the material world. In the Manichean world of the CoID, design could be ‘good’ (modest, functional, transparent, rational and enduring) or ‘bad’ (gauche, ambiguous, emotional and ephemeral). The failures and successes of British industry – measured on technical, aesthetic and moral indices – were regularly called to task on the pages of its magazine. Graphic design, a practice thoroughly implicated in the spectacle of the emerging consumer society, posed a ‘problem’ for Design. ‘The image’ – the aspect of design least susceptible to the CoID’s quasi-scientific and civic-minded approach – was increasingly the immaterial basis of marketing, advertising and Pop design (as well as politics and other ‘serious’ aspects of modern life). Despite occasional forays into the record shops and boutiques of Carnaby Street to report the taste for Pop, Design’s writers were ill-equipped to deal with the ephemeral and fast-changing world they found there. They returned to form which, in the case of graphic design, meant reports on the systematic techniques behind successful corporate images, road signage or the practical failings of public information campaigns. If Design was ideologically inhibited from embracing the ephemeral world of fashion and marketing, it was also unable to provide a platform for the ideas of the consumer society’s most vocal critics. The writings of philosophers like Herbert Marcuse provided the Counter Culture of the late 1960s with a pugnacious critique of the alienating effects of affluence. When the march of progress was measured by the launch of new ‘improved’ products performing old functions, humanity, it was argued, was reduced to ‘one-dimension’. Deprived of their imaginations by advertising, men and women were becoming unable to imagine other ways of living except as consumers. Feeling the pressure of the Counter Culture, Design’s editor responded by invoking the irresistible force of progress (‘the clock cannot be turned back’): designers had to reform rather than reject the world in which they worked. Design froze in the bright lights of consumerism. Unable to endorse the fast-changing image world or to sign up to the more radical utopianism of the Counter Culture, it withdrew into its ‘tried and tested’ world of engineering. Graphic design, which had never been at the centre of Design’s interests, was treated as a peripheral phenomenon, of greatest interest when it corresponded to the magazine’s worldview. 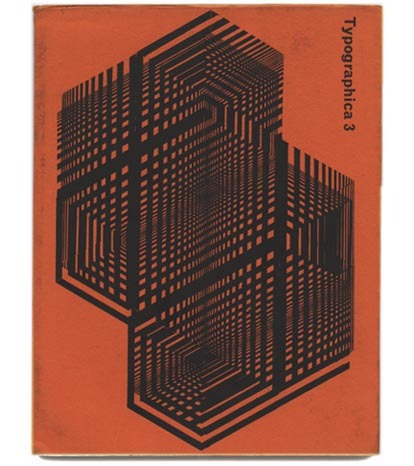 In fact, the only publication published in Britain exclusively covering graphic design during this period was Icographic (1971-1979). The official organ of ICOGRADA (International Council of Graphic Design Associations) and under the editorship of Peter Wallis Burke, this quarterly took a disciplined approach to communication, publishing long and often scholarly articles on the ‘efficiency’ of new alphabets, ‘rational’ classification systems in publishing or the need to ‘move [graphic design] from the applied arts to the applied sciences.’ Graphic design was discussed not in terms of events or products but as a project to improve the world through the exchange of knowledge. Icographic’s writers turned their backs on the steady growth of business-minded graphic design consultancies in Britain and elsewhere in the 1970s. The reproduction of paintings on the paperback covers of Penguin’s ‘Classics’ series was, according to Germano Facetti, less a manipulation of desire than a cultural service: art on the jacket, he suggested, would find its way to those ‘without immediate access to art galleries or museums.’ Icographic could not, however, escape the gravitational pull of economics. From 1972 Letraset International Ltd. provided sponsorship in return for space to promote its new typeface designs, available under licence to typesetting system manufacturers, and its dry transfer lettering. Expressive faces like ‘Shatter’ and ‘Good Vibrations’ struck a colourful and discordant note, out of tune with the journal’s collective and earnest voice. By the same measure, Icographic’squasi-scientific rhetoric did little to support Letraset’s interest in fashion or the passage of its dry transfer letting into the hands of the non-professional designers. 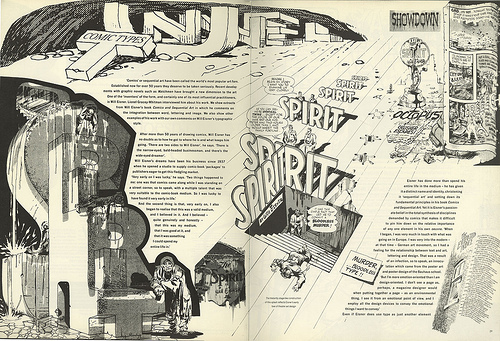 Baseline magazine’s 1990 feature on the comics typography of Will Eisner. In fact, in 1979 Letraset issued its own occasional magazine, Baseline, to showcase its products. Under the art direction of Mike Daines, prominent commercially-minded designers including Erik Spiekermann and Milton Glaser, were given space to experiment with the company’s products and to reflect on the impact of new technologies like laser printing. Although Baseline was not firmly established as a magazine until 1995 (when it was bought by Daines and art director Hans Dieter Reichert), its appearance at the end of the 1970s anticipated a wave of new design titles that engaged directly, and often with enthusiasm, with promotion and marketing. Creative Review, a monthly magazine launched by Marketing Week Communications in 1980, was the first onto the blocks. A sister publication to Marketing Week, it provided a glossy, colour pages in which the output of the ‘creative industries’ could be surveyed. Framed alongside unequivocally commercial products like pop music promos and television advertising, graphic design was presented as a tool which would give an edge to those businesses which made use of its most skilled practitioners. After early issues in which the great and the good lamented the state of creativity, Creative Review established a successful, up-beat formula (still followed today). Unlike its predecessors, it dedicated space to the portfolios of designers working in the commercial sector. Images of the output of individuals and consultancies would be accompanied by a glowing commentary that emphasised the ‘originality’, ‘innovation’ and ‘vision’ of the designer under the spotlight, as well at his or her ability to solve ‘problems’. Technique was discussed, although not necessarily in the familiar terms of materials and tools: readers were as likely to be presented with a discussion of ‘how to master the creative pitch’ as with an article on ‘the art of retouching a photograph.’ In an unconscious echo of post-modern rhetoric associated with thinkers like Jean Baudrillard, Creative Review’s journalists were happy to claim the all-conquering importance of the image ‘at a time’, in the words of one, ‘when style is everything’. In promoting a picture of creativity in market conditions, Creative Review flattered designers and reassured those who commissioned them. Representing those professions which usually operated in conditions of anonymity, the names of designers (alongside animators and illustrators) were carefully reinstated on the pages of Creative Review. And, as if to illustrate this point, Edward Booth-Clibborn, then chairman of D&AD, argued in an early issue that illustrators ought to enjoy the same kind of critical attention as painters. This was not simply a way of generating commissions in the manner of a trade directory: it was a strategy that sought to raise the ‘cultural capital’ of the professional readers of the magazine. Graphic designers, illustrators and other image-makers were represented as masters of creativity rather than as servants to business. Blueprint (1983-present), a title reporting widely across the fields of design, took this trend to its logical conclusion by presenting a ‘star’ designer rather than his or her work on each of its covers in theatrically lit portraits. Although not strictly a ‘celebrity profile’ in the sense of exposing the private lives to public attention, the appearance of graphic designers like Neville Brody on the April 1988 cover with an extensive profile of the ‘tribal typographer’ (one of the least successful labels pinned on him at the time) inside, marked a new stage in the way that graphic design was reported. Blueprint’s starry portraits had a unmistakable influence on other magazines of the day: the fortunes of young graphic designers, Why Not Associates, were given an unmistakable boost when they appeared on the March 1990 cover of Direction within months of graduating from the Royal College of Art). Whilst Blueprint made stars amongst designers, DesignWeek, a weekly launched in 1986 by the publisher of Creative Review, sought to make their names better known to business. Presenting itself as a no-nonsense ‘newsmagazine written specifically for the British design industry’, it launched straight into the business of reporting design as news in September 1996. With very little editorialising in the early issues, DesignWeek made few attempts to judge design on ethical or aesthetic grounds. Significance was understood largely in terms shared by business: competitions, briefs and fees, stocks and shares, relocations, new appointments and redundancies determined the content of the news pages which opened each weekly issue. Fields that might seem to lack glamour from the perspective of Creative Review or Blueprint were its staples. During the late 1980s its pages filled with ‘aspirational’, corporate identity schemes and food packaging with ‘dynamic presence on supermarket shelves’. Whilst DesignWeek’s editorials regularly used the phrase ‘the design cause’, what this meant in practice was the ‘interests of design consultancies’. Whilst Brody might appear on its pages as a newsworthy designer in the 1980s, it was his art direction of Arena and Italian fashion advertising rather than his logos for socialist groups like Red Wedge and his covers of City Limits, a left-leaning London listings magazine, which made good copy. The appearance of new titles in the 1980s represents the growth and the hubris of British graphic design in this period. In retrospect, this boom seems to have been scripted by a number of authors including professional bodies like D&AD, new institutions like London’s Design Museum launched with great publicity in 1988 and, of course, the design press. The label, ‘the Design Decade’, was used without irony to brand the era even before it was over. Repackaging, rebranding and other forms of design sophistry were presented as a panacea for industry; public utilities were ‘remade’ into efficient private companies by new corporate identity schemes; graphic design, it was even claimed, could even win elections. Firmly located within the sphere of what Andrew Wernick called at the time ‘promotional culture’, graphic designers reaped the benefits of this neo-commercial rhetoric. Graphic design (and often design journalism too) had become almost indistinguishable from advertising. The speed at which DesignWeek insinuated itself with graphic, product, vehicle and interior designers and, of course, their clients, was a sign of incontrovertible success: it was and remains the mostly widely read design magazine in Britain. A self-consciously unglamorous title, it worked hard to give amorphous professions (each ultimately defined by competition rather than consensus) a shared sense of community. The response to the collapse of the Michael Peters Group in 1990 is a case in point. Peters, a specialist in packaging design, had developed an enormous and over-extended design business offering diverse services from management consultancy to letter headings by acquiring British and American design companies with funds generated on the stock market. When the Group went into receivership – an event widely interpreted as ‘the end of the goldrush’ in Britain – DesignWeek led the mourning with headlines like ‘Tributes Pour in From A Stunned Design Community’. The newsmagazine also emphasised consensus by dampening down controversy. Speaking for this ‘community’ and reliant on the revenue brought in by the adverts placed on its pages, controversy risked opening up divisive differences. Whilst Creative Review invited disagreement in the form of stage-managed conversations between prominent figures holding different views and DesignWeek took a campaigning stance on the issue of ‘Green Design’ in the early 1990s, any doubts about graphic design’s commercial ‘cause’ or concerns about its social effects remained unspoken. Eye, a quarterly magazine launched under the editorship of Rick Poynor in 1990 by Wordsearch, the publisher of Blueprint, set itself against the grain of current graphic design journalism in Britain. Perfect-bound, beautifully-printed and expensive, it was launched at what seemed an inauspicious moment, one of economic recession. 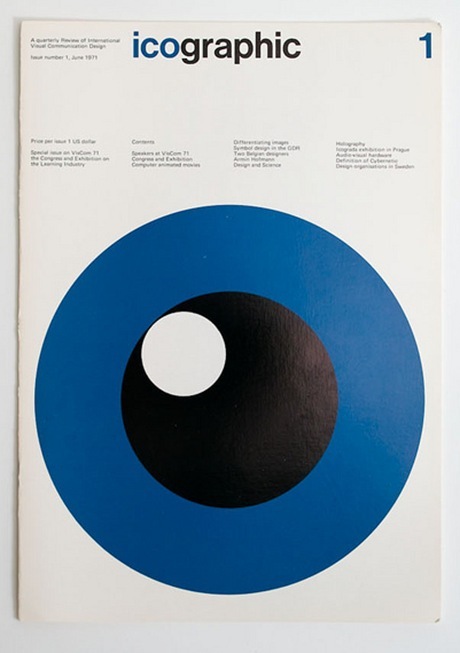 Eye established a wider platform for thinking about graphic design than its predecessors did. Whereas Europe and North America had featured in DesignWeek largely as territories for British design groups to ‘penetrate’, Eye made a self-conscious statement about internationalism by publishing in English, French and German (an undertaking which proved too costly and was abandoned after six issues) and by featuring profiles of prominent designers abroad including politically-uncompromising groups like Grapus in France and socially-minded designers and clients in Germany and the Netherlands. Eye’s self-conscious internationalism created a space for ‘unfashionable’ voices to question the social purposes and effects of design. In an early issue, for instance, explored Jan Van Toorn’s combative approach to graphic design, rooted in the politics of the Counter Culture of the 1960s and in Brechtian aesthetics. The different varieties of design humanism and radicalism found on the continent needed, Eye seemed to argue, to ‘penetrate’ Thatcher-era Britain. Whilst the format and high production values of Eye made it a desirable commodity in its own right, it has regularly featured opinion which expressed anxiety about the seductive powers of graphic design in the marketplace. In 1995 American critic and historian Steven Heller stressed that graphic design repressed its historical relations with advertising in order to emphasise its status as ‘an aesthetic and philosophical pursuit’. Three years later Poynor compressed the point into three blunt words, ‘Design is Advertising’. This had, of course, been implicit on virtually every page of Creative Review for almost two decades. But in a new political climate shaped by global protest, anti-consumerist movements and ‘culture jamming’, this assertion was now an accusation designed to shake graphic designers’s deeply held self-image as agents of culture and progress. The growing critique of consumerism on the pages of Eye made the need for self-reflexivity all the more important (i.e., that contributors, including those on the magazine’s small staff, made their own critical positions explicit). With this in mind, Poynor wrote in 1995 ‘What we hope to achieve with Eye is not so much a “journalistic criticism” … as a “critical journalism” .. informed, thoughtful, sceptical, literate, prepared to take up a position and argue a case.’ This sometimes meant publishing polemical articles designed to generate controversy. When, for instance, Eye was absorbed with the fashionable question of the limits of typographic legibility, it published a forceful piece by Paul Stiff that argued that such designers, in ignoring the findings of cognitive psychology and ergonomics, misunderstood the embodied experience of reading. Stiff, teaching at Reading University, represented an intellectual tradition (expressed in Icographic in the 1970s and Information Design Journal (1979-)) with a deep investment in the morality of clear delivery of information. At its best, Eye’s has acted as a clearing house for diverse and sometimes competing ideas about graphic design from different constituencies. Eye has also regularly featured articles on the history of graphic design. Designers had engaged with the past in the 1980s, albeit only in the limited modes of pastiche and what was then called ‘retrostyling’ (lent an intellectual gloss by limp postmodernist theory). Many of the most prominent repackaging and branding exercises during the ‘boom’ years reworked sentimental and popular visual languages like Victorian ornament and Art Deco styling. Eye took a more whiggish line, arguing that knowledge of history would encourage designers to ‘recapture the sense of self-enquiry and rigour’ that had characterised the profession in its infancy and was, by implication, now lost. This was, in effect, a modernist view that understood history as a set of ideas and ideological conflicts. The mode of these history lessons was predominately biographical, with Eye’s writers exploring a canon established by historians like Philip Meggs. A second line of investigation of anonymous or vernacular design was also developed by the magazine, though not with the same consistency. For instance, investigations into the powerful appeal of mass market women’s magazines promised, at one time, to draw Eye closer to Cultural Studies’s critical interest in the consumption of popular culture. Ultimately, Eye, as a commercial product, has remained wedded to its core readers, graphic designers. This fact continues to limit the extent to which their work can be explored as the anonymous texture of everyday life or tested by moral critique. To have one’s work appear on its pages is still regarded as an endorsement. One of Eye’s major achievements (shared, it must be said, with other prominent titles abroad like Émigré) has been to gestate new writers, many of whom also practice as designers. Although graphic design has a long tradition of designer-writers, most members of this select group have been wedded to the book. In recent years, however, the design magazine has enjoyed a revival (stubbornly resisting the communicative advantages of the internet as a medium). Numerous graphic designers have seized this most ephemeral of products to demonstrate their creativity as designers and writers. A celebrated, early example of this phenomenon was Octavo (1986-1992), an occasional magazine (preceding Eye by four years). 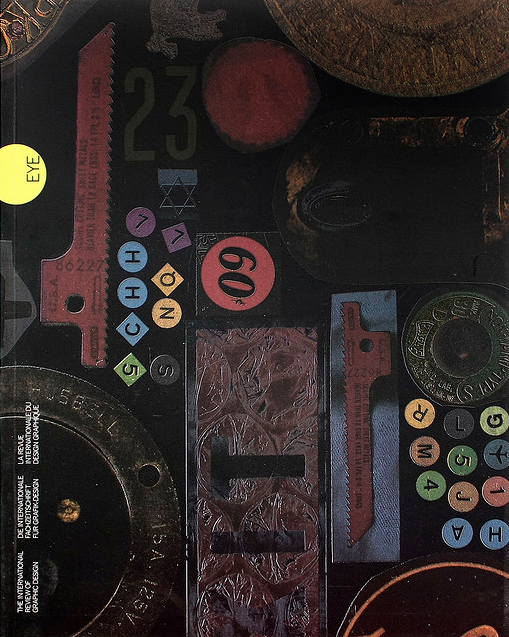 Produced in eight issues by 8vo, a London-based design group established by Simon Johnston, Mark Holt and Hamish Muir, the rigorously structured design of the magazine was striking (an effect all the more pronounced when viewed alongside ‘local’ whimsical and pastiche-ridden designs of the 1980s design boom). Style, on the pages of Octavo, was not ‘everything’: the designers used the magazine as a way of introducing continental design theory and history to its readers. Issue four, for instance, reproduced Wolfgang Weingart’s 1972 lecture “How can one make Swiss typography?” in which he argued that the seemingly objective typographic designs of the Swiss School were ultimately based on intuitive choices and could therefore be used expressively. If the logic of Weingart’s lecture seemed controversially radical in the context of late Swiss asceticism, it seemed remarkably principled in the laissez-faire design world of Britain. 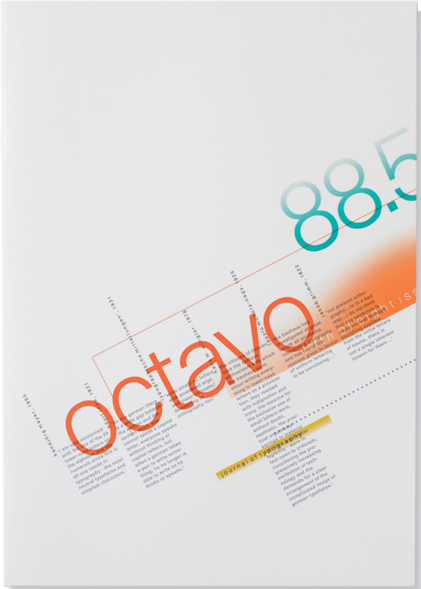 Well versed in the history of modern typography (demonstrated not least by some of the powerfully argued articles on the subject that appeared on its pages) 8vo’s publishing venture invoked the tradition of the pamphlet and the small magazine that characterised avant-gardism in the 1920s. Designer-writers – largely from continental Europe – polemicised in order to communicate the failure of the societies in which they lived or to report the ‘discovery’ of principles with which to build a new world. It is, however, hard to contend that the recent wave of small magazine publishing by designers in Britain can be characterised as cultural and design activism in anything like these terms. Numerous occasional magazines – from Miles, Murray and Sorrell’s Fuel to Abake’s Sexymachinery (2001-) – are so closely defined by a set of ‘personal’ preoccupations with that they are much closer to self-promotion than reportage or cultural intervention. Whilst there has been much discussion of design authorship and ‘no brief’ work in the late 1990s as a way of breaking out of the service relationship which designers have with clients, such liberated publications often present their readers with little more than marginalia. Now that designers have grasped the mantle of authorship, it seems as if they often have little to say. Magazines and journals ought to stimulate intellectual exchange. And this is how they should be judged. 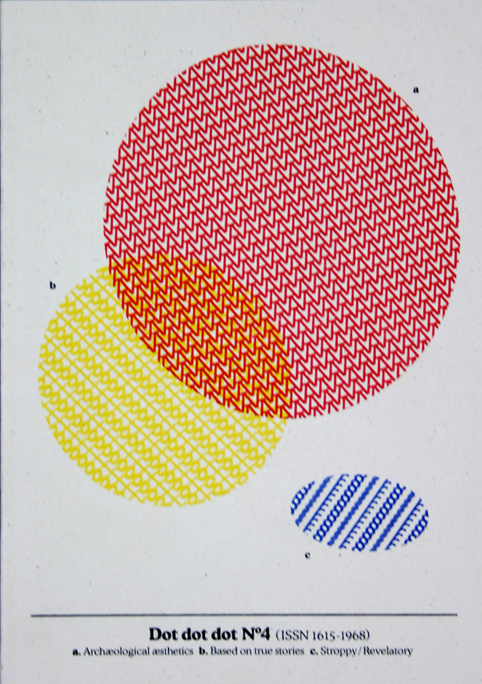 In this regard, Dot.Dot.Dot (2000-) is a welcome and provocative rival to Eye. Founded by Stuart Bailey, a British designer living in Amsterdam, and Peter Bil’ak, a Slovak based in The Hague, this biannual title channels the international ebb and flow of the more experimental and undisciplined currents of graphic design today. Positioning it alongside pop music, experimental film and conceptual art, Dot.Dot.Dot eschews the glossy ‘show and tell’ world of the portfolio or discussion of design as business. Readers are presented with an unpredictable range of articles from the organisation of arcane systems mapping London’s postal and telephone districts and ironic profiles of fictitious designers to more familiar discussions of graphic objects venerated by the cognoscenti. In this messy variety, Bailey and Bil’ak abstain from editorialising in favour of a more pluralist conception of design and design writing. Pluralism is, of course, ultimately a sign of confidence. What remains a limitation of this and, in fact, all of the other titles surveyed in this essay, is the limited character of their readership. Writing on graphic design continues to be a minority interest, even amongst graphic designers. The challenge of persuading those outside the profession of the significance of its intellectual questions and visual pleasures still remains. Editorial in Blueprint, no. 2, vol. 1, November 1983, p. 3. See Corin Hughes-Stanton, ‘What comes after Carnaby Street?’ in Design, 230, February 1968, pp. 42-3; Christopher Cornford, ‘Cold rice pudding and revisionism’in Design, 231, March 1968 pp. 46-8. See Gillian Naylor, ‘The designer v. Jack the paintbrush’ in Design, June 1966, pp.40-49. Corin Hughes-Stanton ‘Leader: One-dimensional man?’ in Design, 240, December 1968, p. 21. Patrick Wallis Burke, ‘The Education of Graphic Designers’ in Icographic, 4, 1972, p. 1. Germano Facetti, ‘Penguin Paperbacks’ in Icographic, 3, 1972, p. 12. See Baseline, no. 6, 1985 and no. 7, 1986 (both edited and designed by Erik Spiekermann). Simon Rocker, ‘Marketing by Design’ in Creative Review, October 1984, p. 46. Edward Booth-Clibborn in conversation with Marina Vaizey, ‘The Art of Illustration’ in Creative Review, April 1983, pp. 28-9. See Neville Brody in conversation with Simon Esterson and Rick Poynor in Blueprint, 46, April 1988, pp. 50-3. Cynthia Kent, ‘A Lively Arena for Brody’ in DesignWeek, 14 November 1986, p. 10. Andrew Wernick, Promotional Culture. Advertising, ideology and symbolic exchange, Sage, 1991. By the end of the 1980s Britain spent the second highest proportion of GNP on advertising in the world. This figure was boosted by the sums spent on promotion by the then Conservative Government. DesignWeek, v. 5, no. 34, 31 August 1990, p. 3. See, for instance, ‘The Green Stuff’ in DesignWeek, 10 February 1989, pp. 14-15. Rick Poynor ‘Design is Advertising’ in Eye, 30, 1998, pp. Rick Poynor and Michael Rock, ‘What is this thing called design criticism?’ in Eye, 16, 1995, p. 57. Paul Stiff, ‘Stop Sitting Around and Start Reading’ in Eye, 11, 1993, pp.4-5. Rick Poynor, ‘An Eye on Graphic Design’ in Blueprint, October 1990, p. 36. Philip Meggs, A History of Graphic Design, Van Nostrand Reinhold Co., 1983. Keith Robertson, ‘Spot the Difference’ in Eye, 15, Winter 1994, pp. 36-43. See Michael Rock, ‘The Designer as Author’ in Eye, 20, Spring 1996, pp. X. This short piece was commissioned in 2011 but not published. It is a set of reflections on how and why the history of graphic design might be written differently. 1 Should a graphic design history be populated with people or with things? There is a growing library of synthesising accounts and a clutch of biographical studies which puts the work of graphic design heroes under the spotlight. This is a largely a nineteenth century model of history writing. Heroic lives were written in order to provide elevated models to which lesser beings could aspire. In this way, readers were addressed as potential supermen. Turning the pages of a well informed biography of, say, Paul Rand or Saul Bass, this emulative model is still in operation. Such life stories tend to form a conventional narrative arc, usually from youthful iconoclast to venerable icon. And those biographies of figures that never existed (such as William Boyd’s Nat Tate or Christopher Wilson’s Ernst Bettler) reveal the preoccupations of the genre better than any ‘real’ historic subjects. 3 It is striking that in his gender-inflected analysis of biography, Featherstone stresses reproduction. The preparation of words and images for reproduction is, of course, is one of the primary roles of graphic design. But how is graphic design itself reproduced? This is not an insignificant question, particularly if it is rephrased: How is it that graphic designers have long sustained a view of their purpose in social and even political terms? After all, graphic design – at least in large parts of the world – has become, as various commentators have told us, just another name for advertising dreck. The answer to this question might be found in its ‘genes’ or, what a few years ago was called, ‘memes’. One can trace lines of inheritance – intellectual, technical and ethical – from the present to the past. I once heard the brilliant graphic designer and design historian, Richard Hollis, talk to a group of young designers about how his teacher at the Central School of Art and Design, Anthony Froshaug, worked at the Hochschule für Gestaltung in Ulm, the school established by former-Bauhausler Max Bill to revive a Weimar vision. That is less than six degrees of separation. 4 Thinking designers are, it seems, attached to the histories of their field of practice for the lines of connection and association they may contain. 5 But could one write a design history without designers? Anonymous production is, of course, of the principle definitions of ephemera, a category often associated with print history. But the problem with ephemera is its marginal status. Ephemeral does not just mean short-lived: it also suggests unimportant. There are many ‘important’ graphic designs of which the matter of their authorship is one of the least interesting aspects of their history. In fact, this might be true of all graphic design. Words and images which appear in print or on screen are not, or not just, interesting for their style or the wit of their creators: their significance lies in what they do in and to the world. 6 History is conventionally organized in lines, curves, arrows and, sometimes, circles. Marx once said ‘Hegel remarks somewhere that all great world-historic facts and personages appear, so to speak, twice. He forgot to add: the first time as tragedy, the second time as farce.’ (In these words, there is perhaps a warning about the instrumental view of graphic design history encompassed in the classroom injunction to ‘repeat after me’). If the history of graphic design is written with the aid of lines and curves, can be written graphically? What do Stefan Themerson’s ‘Kurt Schwitters on a Time Chart’ (with its blanks for the reader to fill) or Bureau d’Etudes’ buzzing cartographies of power have to offer the graphic graphic design historian? 8 So how might we decentre the present? Every work of graphic design made today is historical whether or not we take an interest in the history of its making. This is true in the most simple sense. The letter ‘T’ comes from the Phoenicians via Greek around 1000 BC. Its sans serif form appeared some 500 years later. It was converted into code in the late twentieth century. And its persistence is an example of what Kathleen Hayles, adopting a term from archaeology, calls seriation. The past is folded into the present. 9 Eschewing heroes, the history of ‘t’ or any other graphic device would, perhaps, be an exploration of the longue durée, a prosopography of scribes or perhaps, even a branch of natural history. What is to be gained and lost in such uneventful histories? William Boyd, Nat Tate – An American Artist 1928-1960 (Cambridge, 1998); Christopher Wilson ‘”I’m Only a Designer”: The Double Life of Ernst Bettler’ in Dot.dot.dot (October 2001). ‘Kurt Schwitters on a Time Chart” in Typographica,16 (1967). Michel Serres in coversation in Bruno Latour in Conversations on Science, Culture and Time (Ann Arbor, MI; 1995) pp. 48-9. The Polish Poster School of the 1950s and 1960s casts a long shadow over graphic design. Employing surrealist collage techniques and hand-drawn illustration, figures like Henryk Tomaszewski and Roman Cieślewicz are celebrated for their idiosyncratic approach to image-making. They are credited with resisting the intellectual poverty of communist ideology with individualism and artistry. Forty years later, young designers in the country still have to step out of their deep shadows to make their own careers. This monumental reputation also works retrospectively: the history of graphic design seems to have only one Polish story, the post-war poster. Piotr Rypson’s new book Against All Odds. Polish Graphic Design 1919-1949 is a rich repository of alternative histories. Playing down the poster in favour of a much wider range of printed objects including avant-garde programmes and popular magazines, postage stamps and letterheads, Rypson examines the difference faces of modernism in Poland from the revival of the nation at the end of the First World War to imposition of Stalinism in the late 1940s. He is an expert guide, supplying fast-paced narratives about the commercial, state and political clients for whom graphic designers worked. He moves between avant-garde manifestos like Władysław Strzemiński’s ‘Functional Printing’ of 1935 and anonymous ephemera, tracing how the austere principles associated with die neue Typographie found their way onto the pages of magazines and trade union booklets. These histories are not, however, the major achievement of the book. This lies in the extraordinary range of illustrative examples which have been gathered between its boards. I doubt whether 10% of them have been republished before. And the effect is truly enlightening. The diverse expression and widespread adoption of photomontage stands out: Mieczysław Berman’s steely posters for left-wing parties seem follow blueprints drawn in Weimar Germany and Soviet Russia whereas Janusz Maria Brzeski’s photomontages for Tajny Detektyw (Secret Detective) magazine in the early 1930s have a kind of élan which combines Dada with Hollywood. The decision to cover the 1940s is a good one. 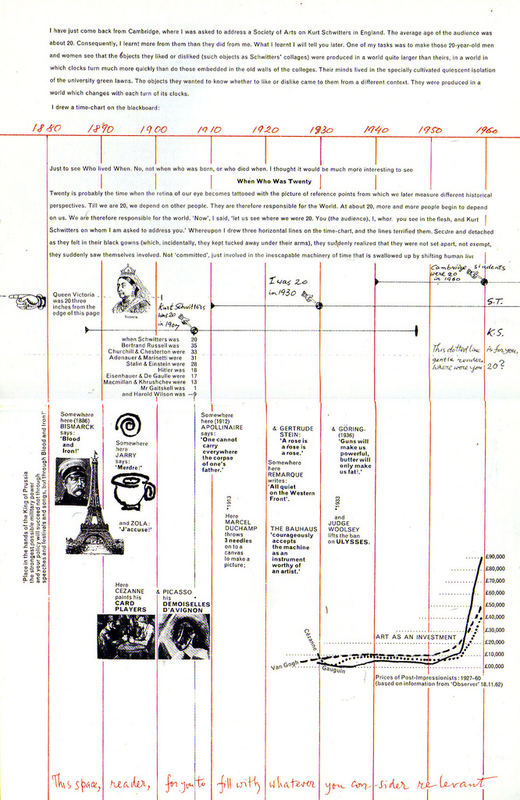 Most design histories follow the chronology of world events or the simple metres of decades. Rypson is making a point: the Second World War did not mark the end of free publishing or imaginative design but that the formation of a one-party state at Moscow’s behest in 1949 did. There are some poignant wartime stories here. Maria Jarema produced truly extraordinary hand-drawn abstract covers for a hand-written book of verse by experimental poet Julian Przyboś in 1943. Produced in an edition of just ten copies, these books asserted the power of the human imagination in the face of occupation, censorship and destruction. 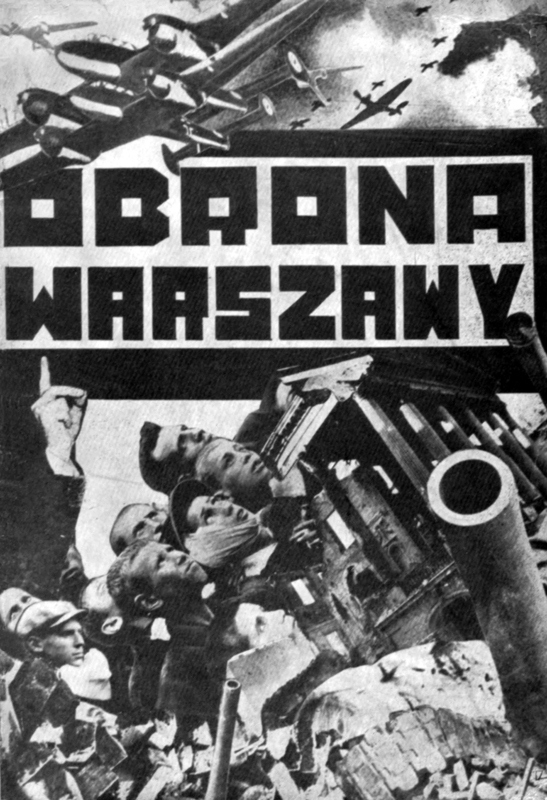 I am also struck by the tragic and unintended irony of the cover of a booklet entitled Obrona Warszawy (The Defence of Warsaw) produced by Polish Jewish socialists in 1942 in New York. Designed by Teresa Żarnowerówna, a one-time constructivist living in the city as a refugee, the book announces the fate of Warsaw, her hometown, in the hands of the Germans. It is a bitter irony that Żarnowerówna, like many constructivist and avant-garde artists in the 1920s – had seized the fragment as a both kind of metaphor for modernity and as a revolutionary device to hasten the modern world into being. Tradition was to be dismantled with the dynamism of montage. But by 1942, the fragment, in the form of broken bodies and shattered buildings on the photomontage cover of Obrona Warszawy, was a tragic demonstration of the destructive power of modernity. For Rypson 1949 marks a kind of fault-line. By then, many of the figures who feature in his book were victims of the Second World War; dead or forced, like Żarnowerówna, to flee the country. The onset of Stalinism was by no means the end of modernist graphic design in Poland as a modest book recently published by Unit Editions, Projekt: The Polish journal of visual art and design, shows. Reviewing the activities and appearance of a very animated art and design magazine first published in 1956 after the dark years of Stalinism, this book gathers covers and spreads by a new generation of designers and artists most of whom made their careers in the People’s Republic. Published in three languages, Projekt was a major vehicle for the promotion of the Polish poster abroad and, in fact, eschewing cover-lines, portraits and the other conventions of commercial publishing, the magazine’s covers functioned as diminutive posters. Charlotte West‘s well-informed introductory essay places less emphasis on interpreting these designs than in examining the relative freedom of the editors to shape its content in the face of censorship. By steering clear of politics, they ensured that the cultural apparatchiks left the magazine and its editors alone. 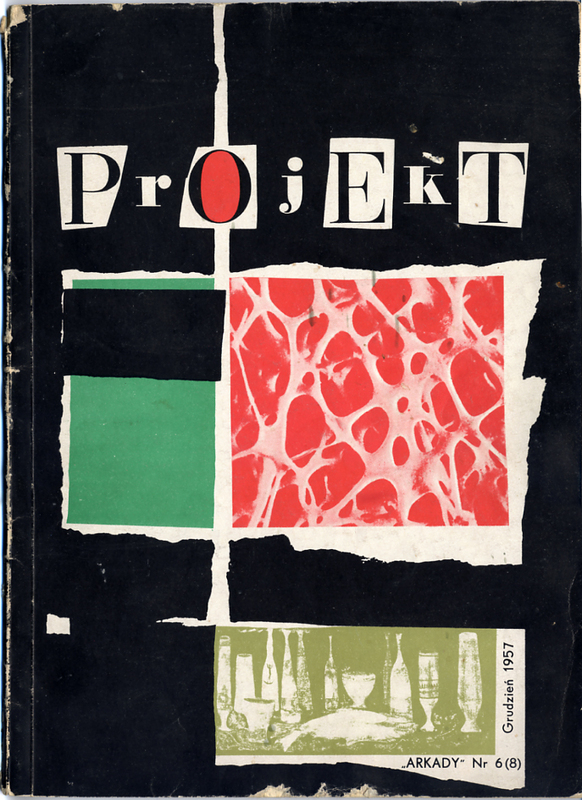 As a result, Projekt became a remarkable champion of modernist graphic design on both sides of the East-West divide during the 1960s and 1970s. In the early 1980s when the authorities imposed Martial Law on the country in an attempt to suppress the Solidarity anti-communist opposition, this strategy became untenable. Projekt’s editors attempted to report the visual language of protest and, facing censure, announced their collective resignation. In the 1970s Cieślewicz turned his scalpel on the magazines which had given him employment in Paris in the 1960s. In a number of commissioned and self-initiated series, he mixed contemporary commercial images with reproductions of historical paintings. Renaissance artists Durer, Uccello and Bronzino as well as David all feature. He called the resulting works ‘photocollages’. This 1977 film was made using these images (with camerawork by Phillip Stollsteiner and Emmanual Meynard, and sound by Francois Libault). Simple and effective, Cieślewicz used a rostrum camera and sounds captured from television and everyday life to express his anxieties about the future. 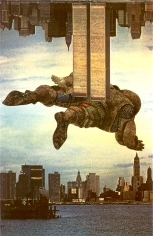 It includes an extraordinary image of the World Trade Center towers laid over a prone knight from Uccello’s painting ‘The Battle of Romano’ (1438-40). Reversing gravity, the steel and glass towers are launched into space talking the dead warrior with them. Bedřich Dlouhý was an occasional poster artist and book designer. Better known as a surrealist painter and a member of the youthful Šmidrové group in Czechoslovakia in the 1950s, he designed posters for art house films directed by Alain Resnais, Michelangelo Antonioni and Federico Fellini as well as less cerebral fare from Hollywood studios. Dlouhý adopted ‘strangeness’ (divnost) in his paintings to issue an irrational critique to the orderly view of the world promoted in the Socialist Republic. In his art, absurd images and grotesque characters signalled a minor act of rebellion. 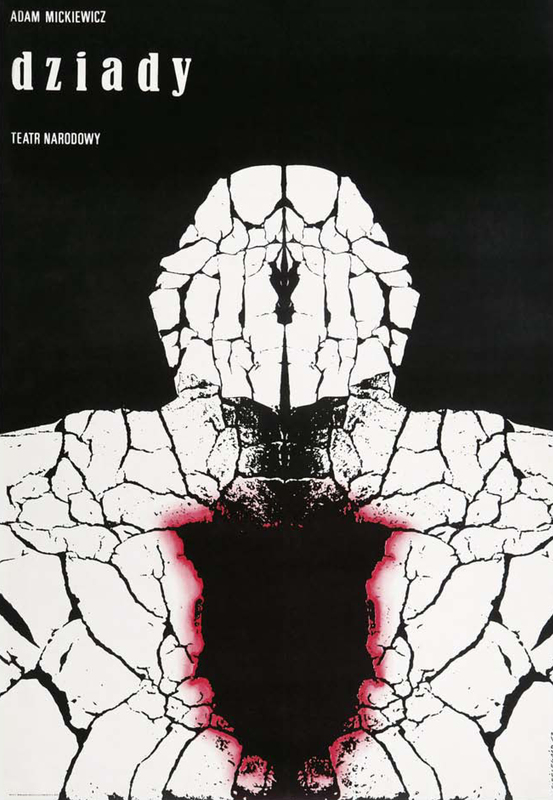 Dlouhý’s 1963 poster for Resnais’s 1959 film ‘Hiroshima Mon Amour’ exploits the then forgotten surrealist technique of frottage. The grainy surface of a piece of knotted wood becomes a drawing as Dlouhý adds strange tendrils and organic burrs. Such doodles represent nothing except, perhaps, the unconscious working of the mind. In this device, Dlouhý captures the melancholic effects of traumatic memory. Over 36 hours, the two central characters – a Japanese architect and his French actress lover – struggle to contain their memories of the recent past; in his case the death of his family in Hiroshima and, in her case, the punishment which she endured for having loved a German soldier in occupied France. On first inspection, the gnarled wooden plank looks like a aerial view of a landscape, perhaps alluding to the devastated view of the city after the atomic bomb had turned Hiroshima into smouldering ruins. When one recognises the anguished hands and forearms which seem to be trying to grip this surface, a new sense of scale reorganises the image. The gesture of the hands suggest a barrier, as if they are clawing at a wall. In the film, the actress recalls her imprisonment in a deep basement by her compatriots after the Liberation: ‘Hands become useless in a cellar. They claw and scape away at the rocks until they bleed. It is all you can think of to help yourself and to remember.’ In this prison of memory, the challenge is to escape the hold of the past over the present. From the very first scene, hands play a key role in the film not least to point to the physical, corporeal nature of trauma and its recall. The opening shot switches from the dusty arms and hands of couple, perhaps brushing off the radioactive soot from the lethal firestorm to the embrace of lovers, locked in passion. When ‘Hiroshima Mon Amour’ was promoted in Western Europe, the publicity tended to emphasise the relationship of the two lovers. The full set of romantic clichés were set in motion – smouldering gazes, romantic clinches. Dlouhý captured something much darker and perhaps much closer to Resnais’ intention. Godard called it ‘he first film without any cinematic references’. 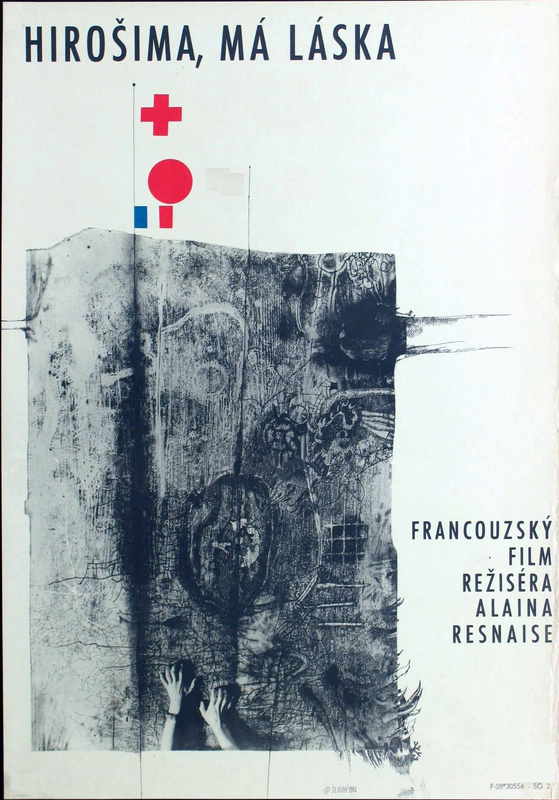 In much the same way, Dlouhýs’ poster was a poster without cinematic clichés. 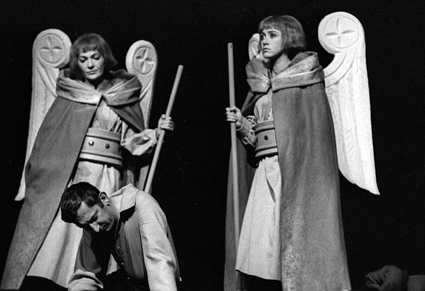 Performance of Dziady, National Theatre, Warsaw, November 1967 (photographed by Mariusz Szyperko). Dziady opened in the National Theatre in November 1967. It had been programmed to mark the fiftieth anniversary of the October Revolution in Russia. The play’s references to dull-witted bureaucrats and Tsarist despotism were in tune with Lenin’s attack on imperial repression. But the Polish audience read the performance as allegory for the present. They jeered the imperial characters and applauded anti- Russian sentiment. The early closure of the play in late January 1968 – allegedly at the request of the Russian Embassy – was the trigger for loud calls for freedom of speech. The Writers’ Union drafted a motion criticizing this act of censorship and, ultimately, the legitimacy of the Sovietbacked authorities. 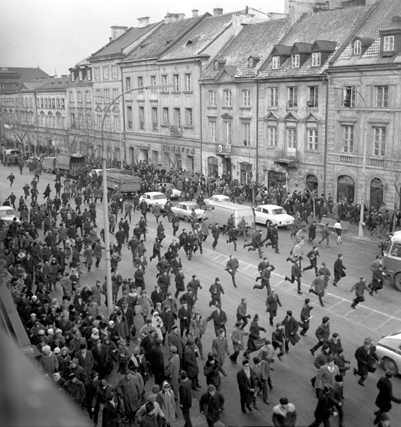 Attack on protestors on Krakowskie Przedmieście near Warsaw University, 3rd March 1968 (photograph by Tadeusz Zagoździński). Warsaw University students marched through the city and strung banners across the city-centre campus objecting to Soviet interference in Polish life. ‘In fighting for Mickiewicz’s play’ they declared, ‘we are fighting for independence and freedom and the democratic traditions of our country’. IBM commissioned Jim Henson, later the hand behind the Muppets, to make a film promoting the MT/ST, an early word processor. Like other IBM promotional films including Charles and Ray Eames’ ‘The Information Machine’ ten years earlier, ‘The Paperwork Explosion’ promised that these labour-saving devices in the office would liberate their users to engage in more productive and creative activities. If paperwork could be given over to self-regulating and self-operating machines, people would be free to ‘think’. 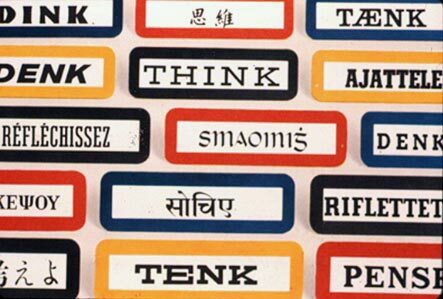 ‘Think’ was of course the one-word slogan coined by the company’s founder, Thomas J. Watson, in the 1920s. Like an injunction, it was inset into buildings and publications as a kind of order from above. The question of what to think was never expressed. ‘Thinking’ was enough. Henson’s 1967 film is a strange object. Office workers express the IBM mantra in a montage of quick cut images. Staring directly to camera and speaking with deadpan voices, they start and finish each other’s sentences like the brand-washed drones in some kind of sci-fi movie. The same sentences are repeated over and over. (Donald Pleasance’s disturbingly calm character in ‘THX 1138’ (1971) comes to mind). This sinister effect is amplified by Raymond Scott’s electronic sound track. These ad hominem passages are interrupted by explosions which fill the air with clouds of paper. One character stands out. Dressed neither in the office uniform nor framed by workers, an elderly man in a garden or farm talks ‘naturally’ to camera. The message is IBM’s but the words are his own. He seems to be the only free human in this corporate universe. Written for Creative Review, this piece looked at the career of the ‘DESIGN RESEARCH UNIT’, the subject of an exhibition at the Cubitt Gallery, London in September and October 2010. A commodity appears at first sight an extremely obvious, trivial thing. But its analysis brings out that it is a very strange thing, abounding in metaphysical subtleties and theological niceties. So far as it is a use-value, there is nothing mysterious about it, whether we consider it from the point of view that by its properties it satisfies human needs, or that it first takes on these properties as the product of human labour. It is absolutely clear that, by his activity, man changes the forms of the materials of nature in such a way as to make them useful to him. The form of wood, for instance, is altered if a table is made out of it. Nevertheless the table continues to be wood, an ordinary sensuous thing. But as soon as it emerges as a commodity, it changes into a thing which transcends sensuousness. It not only stands with its feet on the ground, but, in relation to all other commodities, it stands on its head, and evolves out of its wooden brain grotesque ideas, far more wonderful than if it were to begin dancing of its own free will. This Moleskin ad – by Rogier Wieland – seems to take Marx at his word. The liveliness of things is somehow true of all commodities. But Wieland’s ad points to something else – the desire of static, immobile things to come alive. Or let’s put it another way, the desire of film makers and the advertisers who employ them to animate the inanimate. And of course the hand which appears in the jerky stop-motion sequence at the outset of the ad, is self-consciously inert, particularly when compared the life within the pages of the diary. It is a thingly hand.